As a country that sits on top of the Pacific Rim, Japan has countless public baths. In the past, there were public baths called “sento” in the towns as private baths in the homes were rare in those days. Whole neighborhoods went to their local sento not just to bathe, but to converse and share information. It ended up to be an information hub and was an effective method to build community. The owner of the sento knew its patrons, and if someone didn’t show up for a while, the community knew something was not right. 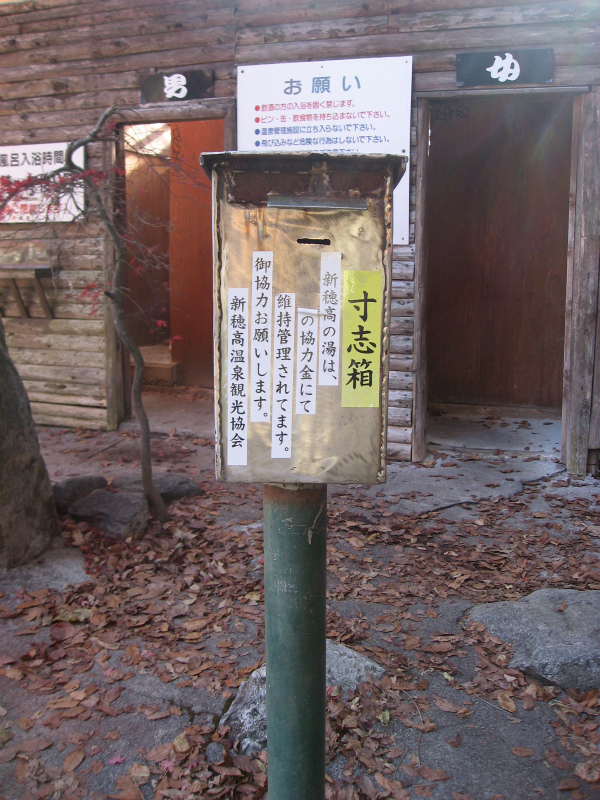 Donation box for the “Shin-hotaka-no yu”. The building in the background is separated into mens (left), womens (right) to change clothes. However, the bath itself is mixed gender. For foreign travellers, the onsen (hot springs) are probably a more accessible form of public baths as they are located in the tourist areas. They are usually within a ryokan (traditional Japanese accommodation) and the onsen is usually only open to ryokan customers (although there are exceptions allowing the general public to enter the facility for baths). However, if one ventures further into the onsen town, there are usually public baths in seemingly random places away from ryokans and other facilities. They usually seem to harmonize so well with the surrounding natural environment, they are not easy to locate. 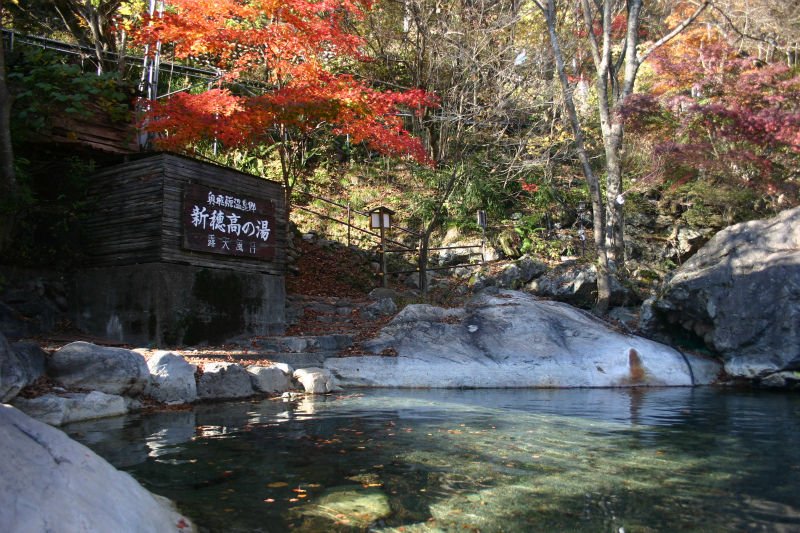 One such bath is the “Shinhotaka-no-yu”, in the Okuhida area, about an hour from Takayama. This outdoor onsen bath is located next to a mountain stream, and bathers can hear the stream from the bath. However, visitors must be prepared. Although there is a separate changing area for men and women, the bath itself is “konyoku” or mixed gender bathing, meaning they don’t separate men and women’s baths. (Which brings into question why they have separate changing areas in the first place…) No bathing suits are allowed and patrons will have to share the bath with other men and women…naked. It is said that most baths in Japan were of mixed gender until strong western influence deemed this practice “inappropriate”. However, this mixed gender bathing takes trust and builds trust amongst the local population and has historically been an important community building practice. So trusting are these bathing facilities that most of them do not have facility managers or employees managing the place. They usually place a donation box and patrons would contribute any amount they wish. Some of the best onsens in Japan are mixed gender, but because of the hidden nature and mental challenge it presents, they are usually only enjoyed by the local population.